André is Partner and CCO at the new launched office of Crispin Porter + Bogusky in Brazil. 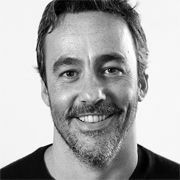 Alongside his longtime Almap BBDO fellow Marcos Medeiros and another Partner, he is heading operations and new businesses. When he came to the Berlin School of Creative Leadership, he was working as a Creative Director at Almap BBDO and thus had been the third Berlin School participant from Almap BBDO, Cannes Lions Agency of the Year 2010 and 2011 (with Berlin School alumni on the team). After 16 years of being a copywriter, André became Creative Director of Almap BBDO in 2011. His trove of awards include the Press Grand Prix at the 2010 Cannes Festival for a Billboard magazine campaign, which was one of the most awarded campaigns of the year according to Creativity. That same year, he was the most awarded copywriter at the Cannes Festival and can boast altogether 13 Cannes Lions, including 5 Gold, 3 Golds at Clios, a Grand Prix at the El Ojo de Iberoamerica, a Grand Prix at the London Festival plus 2 Yellow Pencil at the D&AD and 5 pencils at One Show.